It comes down to a single Filipino word that encapsulates everything that could be gleaned from the now viral footage of the brawl: pikon. In that melee was exhibited a representation of how Filipinos represent their country and the renowned lack of a sense of proportion applied to their collective notion of “national pride”. 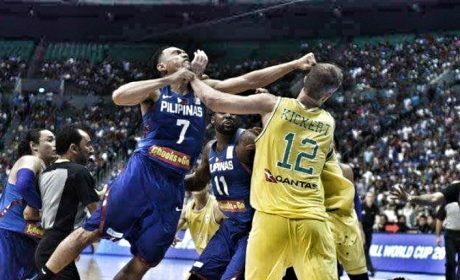 Perhaps there is truth to what is being said about the Australian players — that they said and did things that provoked the players of the Philippines’ Gilas team. But the response of the Filipinos was disproportionate. It was shameful. Worse, it showed the unsportsmanlike way Filipinos fight. The style of fighting that went on display said a lot: punches coming from behind, ganging up on a fallen adversary, throwing chairs (also from behind), attacking then running. Real class acts. The bigger fight that flew above the heads of the Philippines was a challenge to take the high road even in the face of provocation — with dignity and class and a resolve to play better. Instead, the Philippine team and their fans opted for the smaller, easier fight — the one with lower, even negative, returns to the game and to their country. Indeed, the brawl was justified by some as a defense of the motherland. Instead it came across as a quaint national tantrum. It was a display of pent-up frustration over a profound feeling of helplessness and inadequacy at a national level that found a convenient and easy space on the hardcourt to vent. No need for billion-dollar naval fleets and top notch technology to show off one’s national chops to a foreign power. Just a predisposition to throw punches that any corner tambay could deliver will do to prop up national pride. The easy fight. It was, of course, evident that even before the brawl, there was no national pride on exhibit for Filipinos in this disastrous game. Gilas were being flattened by an Australian B-team. This is, after all, Filipino basketball’s pride. And they were being crushed by a no-star Aussie team. This is the bigger tragedy in this shameful incident that will go down Filipino sporting history in infamy — a shamefully-played game followed by a shamefully-fought brawl. Filipino pride suffered a double death today. That ball hugger Romeo who’s better off in a dribling exhibition sums up the disgusting character of the whole Philippine team when he shamelessly justified the brawl on twitter. Even their coach defended his players blaming the Aussies instead. As a host, they failed bigtime by being unsportsmanlike and physically harming their guests. Well I guess he’s the Pinoy version of Dennis Rodman or Isiah Thomas, he’s the Pinoy Bad Boy of basketball & I could see him when he’s playing in the PBA, especially when I’d saw him a few days ago when he’d almost want to had a fight with a player from SMB (which I forgot his name) & thankfully both of them had ejected early after the incident. If that kind of incident continued just like what happened on July 2, then we could really see his true character. You could also see his character on his tweeter message that he will not apologize to the Australian players. Why not put a “game” called: “Basketbrawl”. It would be like , “Ultimate Fighting”. Everything would be allowable…Shot the ball in the basket. Then, if players would have an itch to fight. They would do boxing, kicking, karate, judo, biting, etc…There would be a referee. However, the viewing crowd, would be prevented from participating in the game. The “BasketBrawl ” arena would be protected with sturdy wire fence; and there would be riot Police Guards, around the arena fence. Maybe, our Pambansan Kamao, Sen. Manny Pacquiao, could be trained to play the “BasketBrawl”. He is a Boxing Champion. With his participation, we could become, the world “BasketBrawl” Champion. Meanwhile, Japan’s football (soccer) team, as well as the fans, showed incredible sportsmanship after their loss. Now that’s class in action, not just in words. I think the rest of the world would be better off excluding the Philippines from any international games until Filipino athletes and fans learn the true meaning of sportsmanship. It was also shown on Dutch TV about Japan’s football team’s dressing room and what their fans did with their litter. When Japanese lose, they look inward. They take stock of why they lost, and do their best to plug up the holes so that hopefully they don’t make mistakes again. When Filipinos lose, on the other hand, they look outward. They blame their loss on everybody else but themselves, and keep making the same mistakes over and over again. Exactly. Everything is always somebody else’s fault. The corollary of that view is that you have no control over your own life. If I’m not mistaken that’s the difference between conservatives and liberals. Conservatives focus on building character, liberals focus on building a portfolio of scapegoats for society’s ills. The Moroccon national football team played 3 matches in the group phase during this year’s FIFA World Cup. They lost 2 of them and drew the other. Because of that, they were eliminated. Now what did they say to the press? They blamed the referee and the VAR (video assistant referee). And finally they said they were proud. Proud of what? Of being eliminated? It would have been so much more realistic to say that they were not good enough to progess to the next phase. Mochiron desu, Nihonjin desu, the samurai way is their principle…. But we, the Filipinos, its the other way around: we’re not very humble, apologetic, very rude & Catholic faith of the Filipinos is just an identity & we’re not using it seriously!!! Imagine if instead of Japan had joined the Axis Powers during the Second World War but rather we’d became allies to Germany & Italy & we’d invaded the eastern part of Asia. And after the war, we will NOT apologize the war crimes we’d committed to our Asian neighbors like Japan, China, Vietnam, Malaysia, Indonesia, etc. and the Filipinos are still “pikon” [BTW, the word pikon had no English translation to that word & it’s very Filipino: http://8list.ph/8-filipino-words-that-do-not-translate-to-english-205/%5D and many years later, Philippines will declare World War III just like what Germany had done after they’d lost in World War I. That would be terrible for us & to our country & we’re becoming the “evil empire” of the world, then Philippines is no longer the most hospitable & most friendly nation as we know today. By the way, on this alternative world if the Philippines had joined with the Axis Powers of Germany & Italy instead of Japan during the Second World War, of course the Atomic bomb will be use on this alternative timeline & if the US President Harry Truman had a go signal to use that new & dangerous bomb against our country & accept the unconditional surrender, this will be a REAL complication for the US & her Allies. You know, the Filipinos have this attitude of so called “nanlaban” (or fought back) and we, the Filipinos on that alternative timeline surely WE WILL NOT SURRENDER & WE WILL FOUGHT BACK TO OUR ENEMIES in spite that the Americans had already dropped the Atom bombs on our backyard, not only two Atom bombs but maybe a dozen of them with a combination of an Allied landings in our country, and if those Allied soldiers had landed into our land, they will encounter the War-freaked & “Pikon” Filipinos on the final days of World war II. That’ll be much worst & surely President Truman would really pissed off on that situation. Unlike on the Japanese side on the end of the Second World War, when they heard the news that the 2 Japanese cities had dropped the Atom bomb to their land, they’d accepted the demand of the Allies for the unconditional surrender & when the Allied armies had landed to Japan on a bloodless invasion at the end of the war, the Japanese had either faced back & they’d never faced in front or they even bowed to them as a symbol of respect & apologies and shows how they’d regret on their crimes they’d committed during the war. And some of the Japanese soldiers & generals had committed a “seppuku” if they don’t want to fight with their enemies. Thankfully, Japan had joined with the Axis Powers during World War II & the Philippines was under an American colony at that time because the Japanese are very apologetic & humble in their culture when they done their wrongdoings but for the Filipinos, it’ll be very complicated & sometimes we don’t felt guilty when we done it wrong & this is so called “Kapal ng Mukha” attitude. And that’s a huge BS! ???? >> It was a display of pent-up frustration over a profound feeling of helplessness and inadequacy at a national level that found a convenient and easy space on the hardcourt to vent. Indeed. Harking back to the article on Duterte challenging the Pinoy mode of thinking: he clearly hasn’t had much impact in that area. I can’t help wondering if there’s a bit more to it than that. As Amir Al Bahr said, Pinoys always look outward for the source of their problems, and the generic Foreigner is reviled. It may not have been mere frustration but simply an irresistible opportunity to give a bunch of ‘important’ foreigners a good kicking. Fundamentally the same motivation as primitive tribes going on a raiding party to pummel the next-door tribe. Yeah, it’s like a loser who gets chewed out by his boss at work then goes home and beats up his wife — basically looks for a channel to vent anger that he lacks the guts to express where it matters. How ill-inspired we are when Life, brawling in its crude matter-of-fact way, Decks us with the cold fist of reality. What you’re saying is Not exactly true! Milwaukee Bucks pair Matthew Dellavedova and Thon Maker play for the Australian Boomers. Boomers coach Andrej Lemanis even said welcoming Dellavedova and Maker into the squad was exciting on a number of fronts.